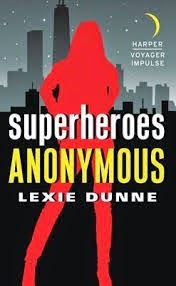 After focusing so much on middle grade speculative fiction for the Cybils these past few months, it was nice to turn to a fun, fast adult book--Superheroes Anonymous, by Lexie Dunne (Harper Voyager Impulse, Nov. 2014) . No-one calls Gail by name anymore, not even her boyfriend--instead, she's just known as "Girl," short for "Hostage Girl." Over and over again, Gail is abducted by super-villains, and over and over again, her own personal superhero Blaze saves her. He never speaks, just saves...and though Gail is tired of being a hostage ad naseum, she's at least got her role down pat. Then her boyfriend (who everyone--media, co-workers, and, it seems, super villains) moves to Miami...and the kidnappings stop--if Blaze isn't going to be there to save her/be lured to villainous traps, there's no point. But one villain doesn't get the message. He kidnaps Gail, and in his lair of evil insanity he inadvertently bestows superpowers on her. So yeah, fun and fast. It's an entertaining set-up of superhero/villain high-jinx, and the pages turned quickly. I couldn't help but be annoyed by how the Superhero folks treated Gail-sticking her in a windowless room, giving her standard issue workout uniforms to wear, and not explaining details like food or future or anything and not giving her books or electronic devices. And I was annoyed at Gail, for not being more bothered--sure, she's used to being a passive victim, but she could question things just a tad more proactively. On the other hand, I enjoyed her relationship with "Blaze" very much (he's rather attractive in personality as well as appearance), and on the strength of that, I can recommend this with conviction to fans of romantic spec. fic. It's one I think YA spec fic readers, used to sharing adventure with romance, would enjoy in particular. (minor thing that's troubling me--what the heck happened to Vicki in the bit at the end? I re-read it to see if I'd missed something, but didn't see anything about what was up with her.....odd). What is it about superheroes? I've got a thing for them, too, and it seems like it's the latest thing across all genres. You'd think we'd think they were stupid, but somehow . . . Maybe they make really good metaphors for wanting to be in control and be safe, and the world is feeling less safe and in control all the time. Or maybe they're just cool!